A few days ago we had reported that Unicron #6 and Optimus Prime #25 were pushed back to 14th November and 21st September respectively, while Lost Light #25 remained scheduled for Halloween. 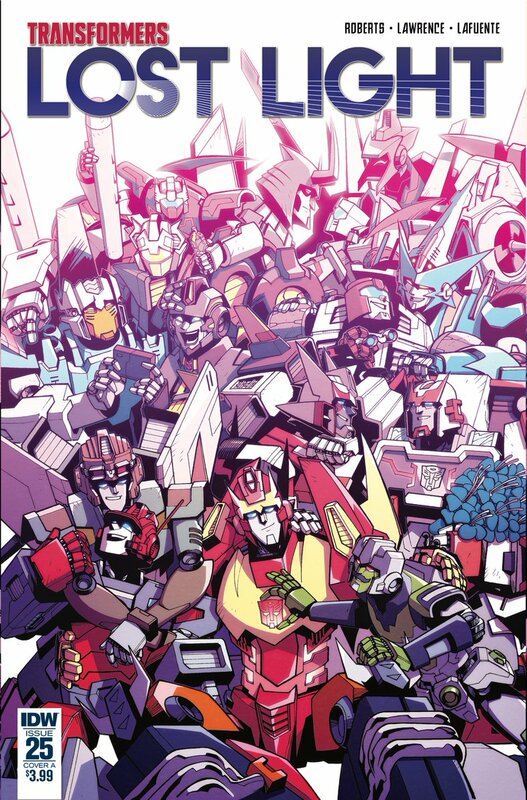 Sadly, a tweet from Action And Adventure confirms that Lost Light #25 has been pushed back to 7th November. A Halloween release has proven too spooky for Lost Light #25, which has now had its projected release date pushed back to 7th November. Unicron #6 and Optimus Prime #25’s projected dates remain at 14th and 21st November respectively. Fans who were expecting to read the final issue of the adventures of Rodimus’ crew now will have to wait two more weeks for the gran finale. Were you expecting this? Happy? Angry? Disappointed? Let us know on the 2005 Boards! It's been done for ages, this is either the usual printing/shipping delays or them deliberately moving it so that the last three books are on consecutive weeks. Don't make me hurt IDW. Jut rip the bandaid off and get it over with. What I’m most intrigued to see is the final fate of Megatron I’ve never liked this character so much before and now I really want to know how he ends up. Actually kinda surprised that so far we’ve had nearly 427 issues in this continuity (Wikipedia surprisingly accurate) and neither Optimus nor Megatron have died once. When does the new series suppose to start? Other than next year but not in January because we've had the solicitations already, we don't know yet. They trying to create hype. Just FYI, I don’t believe its getting pushed back to “get the quality straight”…the book has been completed for a while. Just FYI, I don’t believe its getting pushed back to “get the quality straight”…the book has been completed for a while. All the creators involved have mentioned as such on Twitter, even the letterer. It looks like the delay is a desire to have it more line up with the rest of the endings that were delayed already. Just because the release date happened to be on Halloween? Did the powers that be just happen to discover Halloween is celebrated by some on Oct. 31? Talk about a rather lame excuse.